106 Commerce Street, Suite 105 Lake Mary, FL 32746 TEL: 407.878.7606 • FAX: 407.878.7611 For additional copies, order at GuidelineCentral.com Copyright © 2017 All rights reserved ATSMEC1713 Disclaimer is Guideline attempts to define principles of practice that should produce high-quality patient care. It is applicable to specialists, primary care, and providers at all levels. is Guideline should not be considered exclusive of other methods of care reasonably directed at obtaining the same results. e ultimate judgment concerning the propriety of any course of conduct must be made by the clinician aer consideration of each individual patient situation. Neither IGC, the medical associations, nor the authors endorse any product or service associated with the distributor of this clinical reference tool. Abbreviations ATS, American oracic Society; CHEST, e American College of Chest Physicians; CHF, congestive heart failure; CLT, cuff leak test; COPD, chronic obstructive pulmonary disease; CPAP, Continuous positive airway pressure; PES, post-extubation stridor; SBT, spontaneous breathing trial; NIV, non-invasive ventilation Sources Schmidt GA, et al. Official Executive Summary of an American oracic Society / American College of Chest Physicians Clinical Practice Guideline: Liberation from Mechanical Ventilation in Critically Ill Adults. Am J Respir Crit Care Med 2017; 195(1):115-119 and CHEST 2017; 151(1):160–165. Girard TD, et al. Liberation from Mechanical Ventilation in Critically Ill Adults: An Official American oracic Society/American College of Chest Physicians Clinical Practice Guideline. Rehabilitation Protocols, Ventilator Liberation Protocols, and Cuff Leak Tests. Am J Respir Crit Care Med 2017; 195(1):120-133. Ouellette DR, et al. 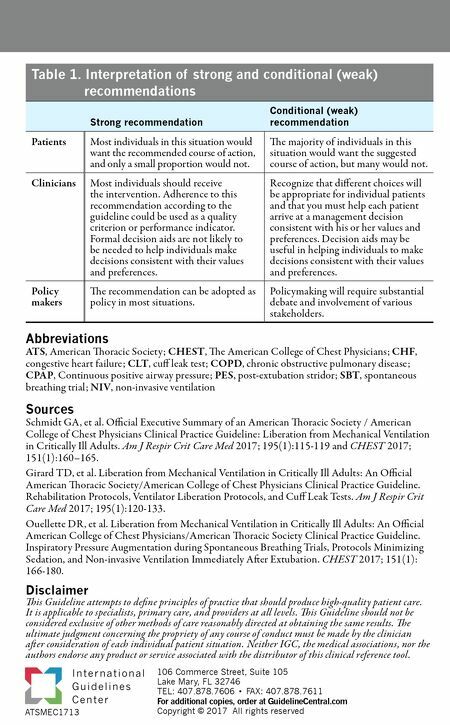 Liberation from Mechanical Ventilation in Critically Ill Adults: An Official American College of Chest Physicians/American oracic Society Clinical Practice Guideline. Inspiratory Pressure Augmentation during Spontaneous Breathing Trials, Protocols Minimizing Sedation, and Non-invasive Ventilation Immediately Aer Extubation. CHEST 2017; 151(1): 166-180. Table 1. Interpretation of strong and conditional (weak) recommendations Strong recommendation Conditional (weak) recommendation Patients Most individuals in this situation would want the recommended course of action, and only a small proportion would not. e majority of individuals in this situation would want the suggested course of action, but many would not. Clinicians Most individuals should receive the intervention. Adherence to this recommendation according to the guideline could be used as a quality criterion or performance indicator. Formal decision aids are not likely to be needed to help individuals make decisions consistent with their values and preferences. Recognize that different choices will be appropriate for individual patients and that you must help each patient arrive at a management decision consistent with his or her values and preferences. Decision aids may be useful in helping individuals to make decisions consistent with their values and preferences. Policy makers e recommendation can be adopted as policy in most situations. Policymaking will require substantial debate and involvement of various stakeholders.